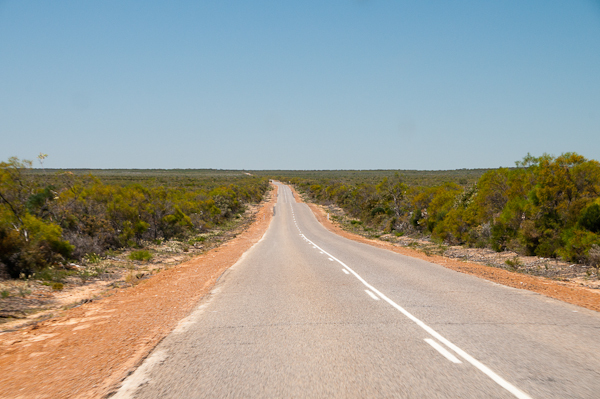 It was a long drive between the gorge and Hamelin Pool, long, hot and boring with most of looking like the road below. For hours and hours. 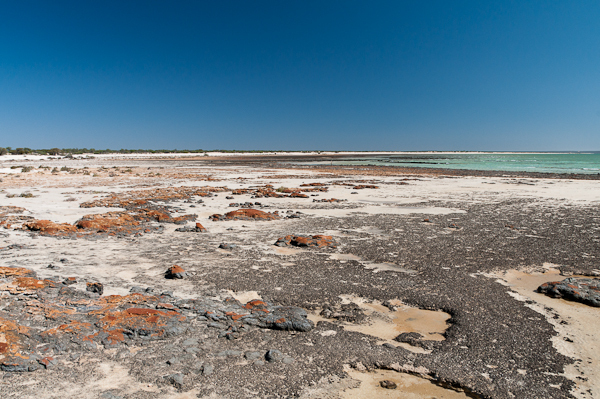 We turned off the highway and onto the road to Denham – there’s still an hour or so of solid driving to go from that point, but we were making good time so we stopped off at Hamelin Pool, a tiny homestead and former telegraph station at the bottom of Shark Bay. 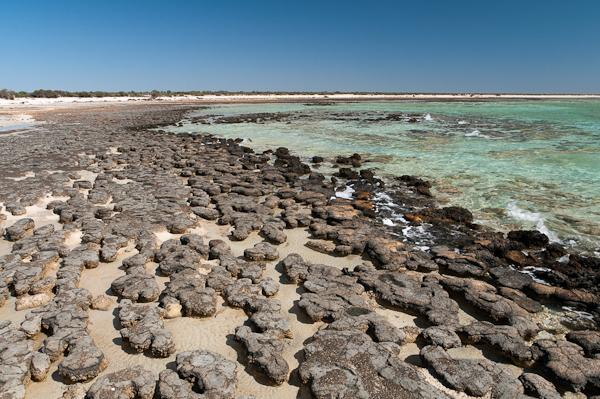 It’s famous for its Stromatolites, which are rock like structures, formed from the actions of tiny cyanobacteria that grow in the hyper-saline waters, slowly trapping sand and mud which forms new layers, growing only few mm a year. These creatures are some of the earliest life forms on the planet and and form a major constituent of the fossil record for about the first 3.5 billion years of life on earth. Using sunlight, they synthesise carbon dioxide to produce oxygen. In fact, it is thought that during those billions of years, they were pretty much solely responsible for creating the oxygen rich atmosphere we enjoy today. 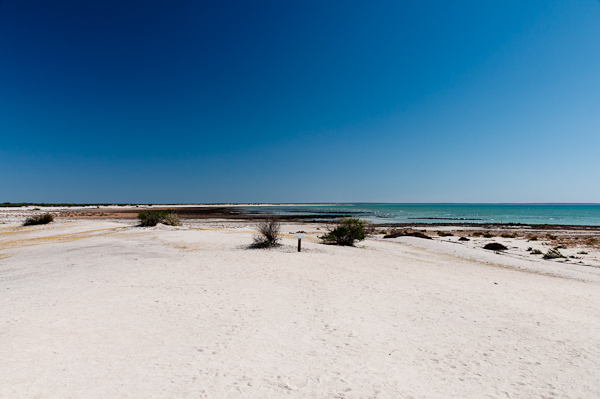 It is also totally unspoiled here, being a protected world heritage zone – the place is gorgeous! 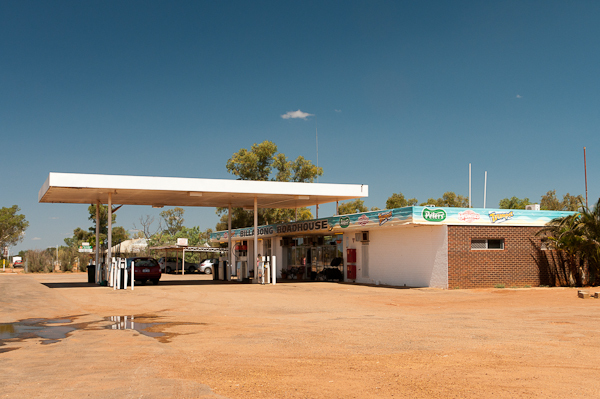 We drove the hour or so down the only road to Denham, undulating its way though the scrub like bush, before the first signs of human habitation appear and we pulled into town. Denham is a lovely little place, a few restaurants, caravan parks, a hotel or two, some supermarkets and petrol stations. Its really the only town in Shark Bay, so it has everything you could want. Our self catering apartment was nice – basic but clean and with lots of space and only 30 seconds walk from the beach and gorgeous sunsets every night. 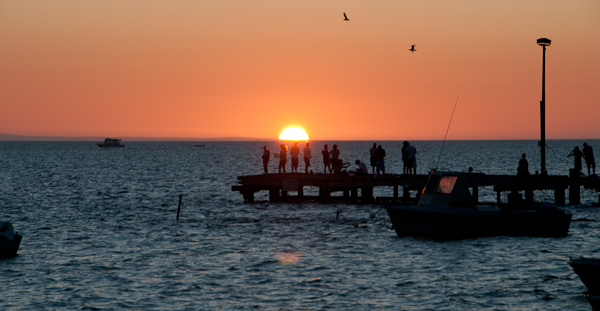 Next up, Shell Beach, Monkey Mia, Dolphins and adventures off road. It is wonderful – there is so much coastline that is so far away from any meaningful civilisation that it’s easy to find deserted white sand beaches with crystal clear water. Perfect for camping and getting right away from everything. It is very remote – its a couple of hours drive in either direction from anything else – but its a pretty cool place – they play cool music (rock and roill oldies I guess is the best way to describe it), do good food (costs a fortune though, but hey, they have to live there, they deserve to get paid well for it) and they are very friendly. The only downdide were the toilets. What is it with public toilets, even nice ones, that people feel the need to behave like a rampaging pooing bear in them? Would they do that at home? I think not!! You could definitely set that place to a thriller horror movie scene, its like some of the set from Dusk to Dawn! LOL!! You just made me snort tea with the rampaging pooing bear analogy. Hello. This is very lovely page. I have also wordpress blogging about caravans. Very nice job you did. thanks for everyone with you.